Oriental Bicolours are relatively new to the UK, the first being imported in 2004. They are cats of Oriental type and colouring with splashes of white resulting from the gene for white spotting. They come in full coloured and pointed versions and can be shorthaired or longhaired. 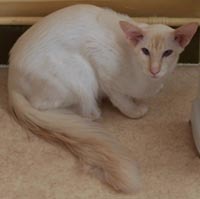 Unlike Oriental and Siamese, Oriental Bicolour Shorthairs may carry the gene for Longhair. For Show purposes the cats must display at least one third white. There must be white on the face, on all four feet and along the underside of the cat. 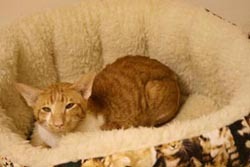 Cats from Bicolour matings without white can not be shown and can not be used in non-Bicolour breeding with GCCF. They can be shown with TICA & FIFE. Siamese need little introduction. With their distinctive appearance and extrovert temperament they remain one of the most popular breeds. 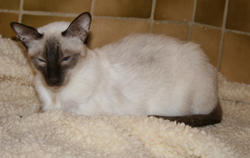 As Siamese are very people orientated they make excellent companions. They are very playful, time wasters but do need a lot of attention. We breed for strong, but not extreme modern type. The ideal being a beautifully balanced cat: lithe, slim and elegant with large ears and oriental shaped blue eyes. Although our first Siamese Cat was a Chocolate Point, we have concentrated on the 32 series. At the moment we have Tortie and Cream Point Queens. Balinese are basically Siamese with longish, flowing coats and plumed tails. These very attractive cats share the affectionate wicked temperament of their Siamese cousins. Balinese originated in America where interest was shown in longhair kittens which occasionally appeared in Siamese litters. In the 1950’s some breeders decided to work with these attractive cats to develop them into a new breed. The first cats introduced into England were heavy and thick coated. 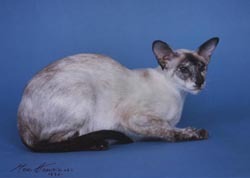 Since then Balinese have been outcrossed with Siamese to improve type and develop a finer, softer coat. Unfortunately, with just a few exceptions, Balinese type is still a long way behind that of the best Siamese. Balinese Variants are the offspring of Balinese x Siamese matings. They are shorthaired cats carrying the gene for longhair. We are very aware of the responsibility of breeders to safeguard the health of their breeds and believe that a wide gene pool is essential. As a result we feel that other things that merely improving type must be considered. The best way to achieve this is to outcross with Siamese, and so we often have Balinese Variant kittens for sale.